The tide is turning in the recruitment industry as the market is becoming more candidate-centric. Having an effective applicant tracking system helps you source talent faster, track candidates, schedule interviews all from within one interface and automate them. Effective candidate management focuses on getting what your company needs the most -- Great candidates and good revenue. Zoho Recruit's recruiting software combines multiple functions or tasks into a single click. Reduce mundane tasks and concentrate more on finding quality candidates. Pre-defined set of actions (alerts, tasks and field updates) are executed when certain conditions are met. Get a universal view of all candidates with just one glance, and know where every candidate is at every step in the process. Send automated replies and follow-up emails through auto responders. For example, send out brief mail to candidates letting them notify once you receive their application. Make the most informed decisions at the right time. 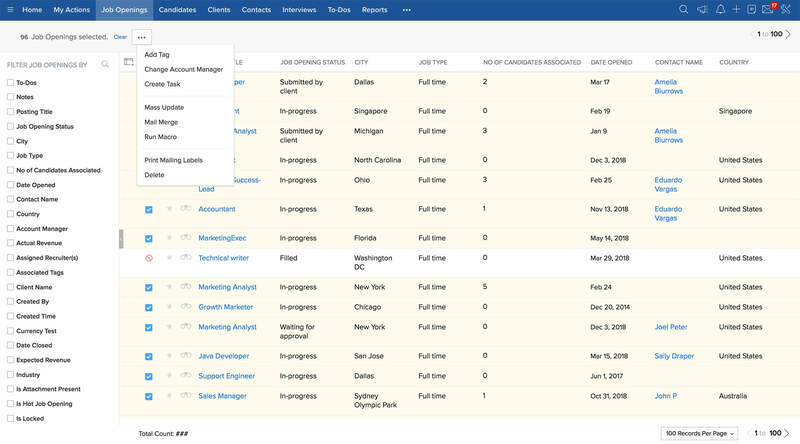 Generate reports with advanced Recruit analytics to get insight into candidate interview status, job opening status, and much more. Keep everyone in the know and discuss among your recruiting team by adding comments and @mentions. Candidate relationship management (CRM) is method used by recruiters to encourage candidate management and improve candidate experience. Give your hiring team the bird's eye view of the candidate status and easily identify next steps and efficiently move candidates through the different stages of hiring. Canidates are every firm's greatest and most valuable asset, it's important that finding and engaging them should be a top priority for your organisation. With Zoho Recruit's ATS system identify and track the soure of your candidates. The advanced analytics helps you find from which sources you've found talent and the candidate status for the job opening. Get a holistic view from the number of candidates associated with a job to number of candidates hired and streamline your recruitment system. Reviewing resumes and moving the best candidate forward is ideal for any recruiter. Before even the actual interview process begins, assess the candidate based on a predefined set of questionnaire. For example, you want to hire a web developer for your firm and you're looking for a person with more than 5 years of experience. Declutter your candidates by asking must have skill set for that particular job in the initial stages of the recruitment process and reduce time-to-fill. Find, qualify and engage candidates faster with semantic search. Matching the right talent with the right job opening is all that matters for a recruiter, make this process more efficient with Zoho Recurit recruiting software. No matter how expansive your candidate database is, our algorithm matches all key criteria mentioned in your job description with few milliseconds. Get a complete list of suggested candidates and in the details page our ATS generates percentage at which the candidate matches the job. Whether you are an in-house recruiter or agency recruiter, it's a good idea to send regular updates to your clients or hiring team. 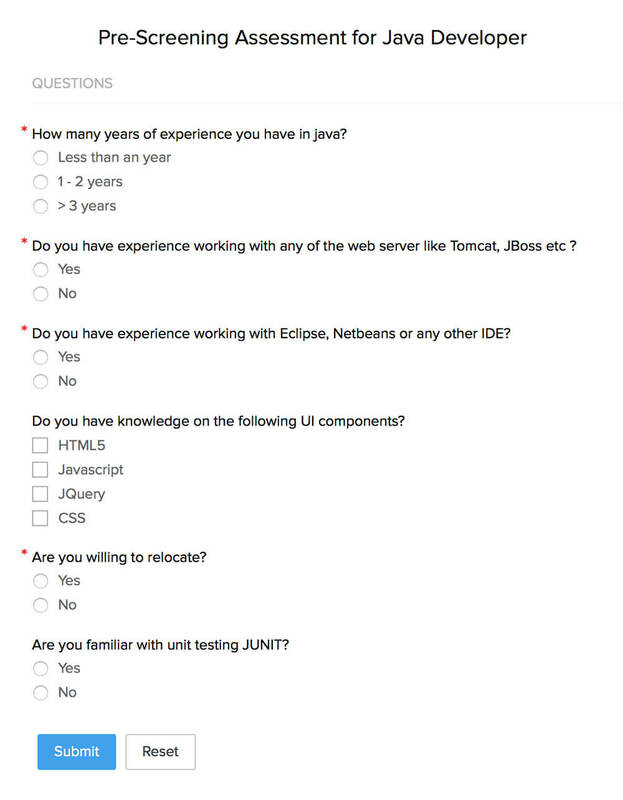 Found more than one candidate perfect for a job? select all relevant candidates on one go and associate them to a job opening. Progress them all to the next stage in the hiring pipeline by changing the candidate status in bulk. Mass update fields in the candidate details page, send mass emails, SMS and submit them to clients for review with a single click. Bridge the gap between you and your client by providing a portal that manages business relationship and hiring management directly with the recruiting team. Cut down on lengthy email conversations and ensure smooth collaboration. Zoho Recruit Client Portal allows clients to create a new job opening, send feedback on candidates submitted to them for review and make interview decisions. Create customized client portal invite to clients and add client user and set profile permissions. Streamline the final stage of your hiring process. 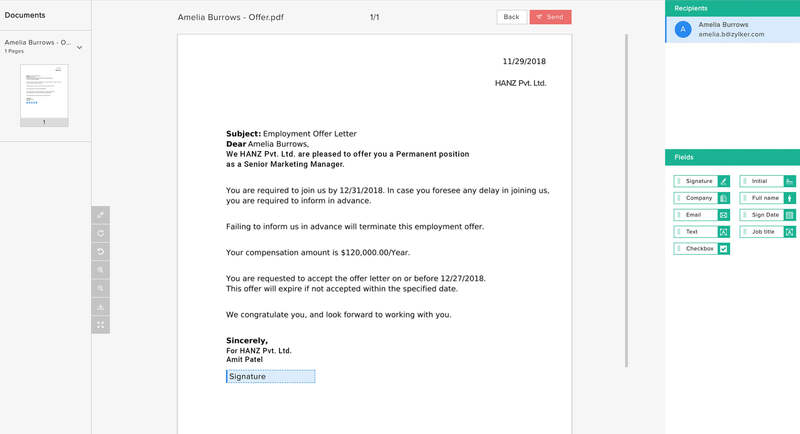 Create and customize offer letter templates and ensure job offers are accepted on time along with e-signature. Set the expiration date for offer letters so that no one is left in the dark. Within just a few clicks get your digital candidate acceptance with e-signature platforms.